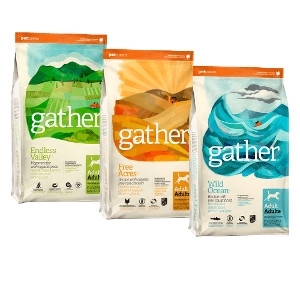 Our idea behind GATHER™ was to craft a new kind of pet food, using certified and organic ingredients, perfectly blended and balanced to provide your dog with premium quality, natural nutrition. We kicked at the dirt in their fields, inspected their farms, stood on their boats and found a handful of farmers, growers and fishers who were practicing the responsible, sustainable production of extraordinary quality, certified and organic ingredients. Those who survived our scrutiny have become our trusted partners in GATHER; functional, whole food from the earth and ocean, with nothing added that’s not needed. We gather you’ll like it. Introducing WILD OCEAN Line-Caught Cod, FREE ACRES Organic Free-Run Chicken and ENDLESS VALLEY Vegan recipes for adult dogs.